Eric Powell (March 3, 1975) is an American comic book writer/artist, best known as the creator of The Goon. 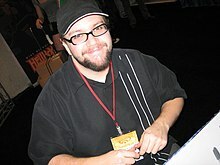 Powell has written and provided artwork for Dark Horse, DC Comics and Marvel Comics, but is most regarded for his original series The Goon, which debuted from the small publisher Avatar Press. Powell quickly switched to self-publishing under the moniker Albatross Exploding Funny Books, before being picked up by Dark Horse after only a handful of issues. 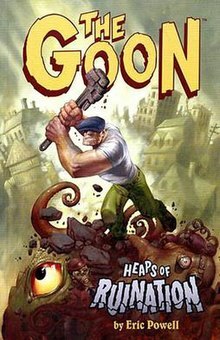 The Goon's quality was recognized with an Eisner Award in 2004 for Best Single Issue (Dark Horse The Goon #1) as well as an International Horror Guild award. The following year, Powell won Eisner's Best Humor Publication and Best Continuing Series awards. He is a featured interviewee in the movie Independents. Powell co-wrote the first two volumes of IDW's Godzilla: Kingdom of Monsters with Tracy Marsh. Wikimedia Commons has media related to Eric Powell. This page was last edited on 26 January 2018, at 01:18 (UTC).